It is a truth universally acknowledged…that everyone wants their own Star Wars droid. If you’re now thinking “No, not me!”, then you obviously haven’t met the right droid yet. 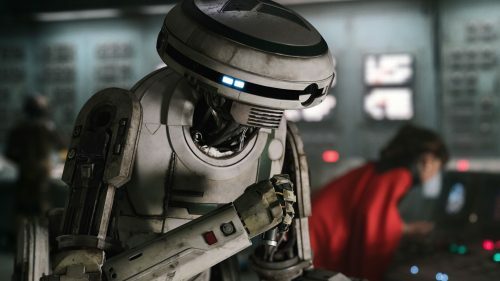 But Patrick ‘PatchBOTS‘ Stefanski has, and that droid is L3-37 from the newly released Solo: A Star Wars Story. Visit your local maker event, such as Maker Faire, and you’re sure to meet at least one droid builder. Building a Star Wars droid is pretty much every maker’s dream, and YouTube droid-building sensation Patrick Stefanski is living that dream. On his Youtube channel PatchBOTS, Patrick is showcasing his maker chops with truly impressive recreations of characters such as BB-8 and our personal favourite, Chopper from Star Wars Rebels. Patrick’s new L3-37 build uses the free Alexa Voice Service and a Raspberry Pi 3 to augment a 3D-printed base model with robotics and AI. He designed L3-37’s head based on press images and trailers, and then adjusted some of the visual aesthetic after watching the movie. When he realised that the Amazon Echo Dot he’d started the build with wouldn’t allow him to implement some of the features he had planned, including a unique wake word, Patrick decided to use a Raspberry Pi instead. A wake word is the word a home assistant uses to recognise that you’re addressing it. For Amazon Alexa, the standard wake words are ‘Alexa’, ‘Echo’, ‘Amazon’, and ‘computer’. While these are fine for standard daily use, Patrick wanted his droid to acknowledge its own name, L3-37. He also wanted to make L3-37 react with a voice response and movement whenever it heard its name. Using the Raspberry Pi enabled him to edit the home assistant code to include these functionalities, and in this way he made L3-37 truly come to life. If you’d like to build your own L3-37 (and why wouldn’t you), Patrick is in the process of adding the complete set of instructions and code to his Github account. The 3D printer files are available now to get you started, along with the list of ingredients for the build, including servos, NeoPixels, and every propmaker’s staple: Rub n Buff. If you want buy the parts for this project, why not use the affiliate links Patrick provides in the L3-37 video description to help him fund future projects? And while you’re there, leave a comment to show him some love for this incredible droid build, and also subscribe to his channel to see what he comes up with next. We’re definitely going to be taking some of the lessons learned in this project to work on our own builds, and we hope you’ll do the same and share your work with us via social media. Changing the wake word will definitely make the whole ‘Alex vs. Alexa’ issue in my house A LOT easier. Awesome. What really needs to happen next is somebody needs to manufacture a double din touchscreen with hdmi and USB hookups, a mounting point for a Pi, and a power circuit that allows the Pi to power itself off properly when the robot turns off. Did he change the voice to sound like it did in the movie? Look who’s coming to Raspberry Fields 2018! You love it. We know.